Ashampoo Music Studio portable is the complete solution for your music and audio files. 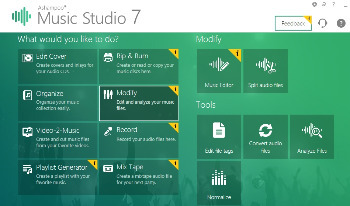 Record, rip, burn, cut, convert and mix your songs. Organize your music collection, create playlists, design and print covers – perfect results are always just a few clicks away! Enjoy your songs on any device in any place whether it’s your PC, smartphone, MP3 player or car! When you’re creating a music disc based on songs from different sources, you’ll frequently encounter various different volume levels. Normalization can spare you the need to manually adjust volumes by making your music sound more professional and harmonic. Ashampoo Music Studio 7 now also supports normalization for WMA and formats based on additional codecs! Aside from their file names, audio files also contain information about artist, album, genre and cover. Ashampoo Music Studio 7 adds and completes these tags automatically, turning “Track1-unknown” into “The Beatles – Yesterday – Help”!